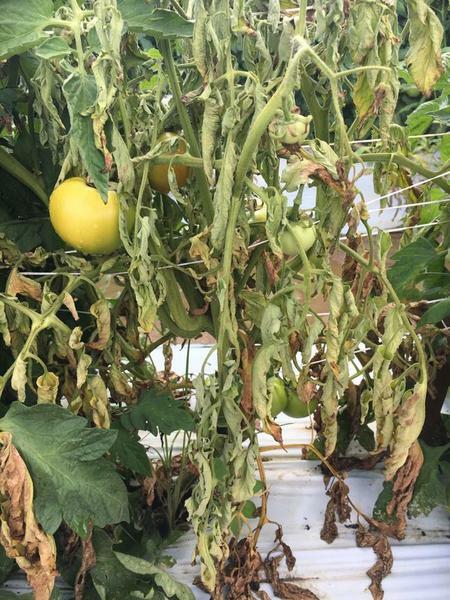 Southern blight, also known as southern wilt and southern stem rot, is a serious and frequent disease of vegetable crops in North Carolina. The disease was first reported on tomato but also occurs on hundreds of other economically important crops including pepper, bean, cantaloupe, carrot, potato, sweet potato, watermelon, cotton, peanut, tobacco, and soybean. High temperatures (77 to 95°F), aerobic and moist conditions, and acidic soil favor disease development. In North Carolina, the disease will first appear in “hot spots” in fields in early to mid-summer and progress until cooler, dryer conditions prevail. Southern blight is caused by the soil-borne fungus Athelia rolfsii (=Sclerotium rolfsii). For more information on Southern blight including signs and symptoms and disease management, view the entire publication. 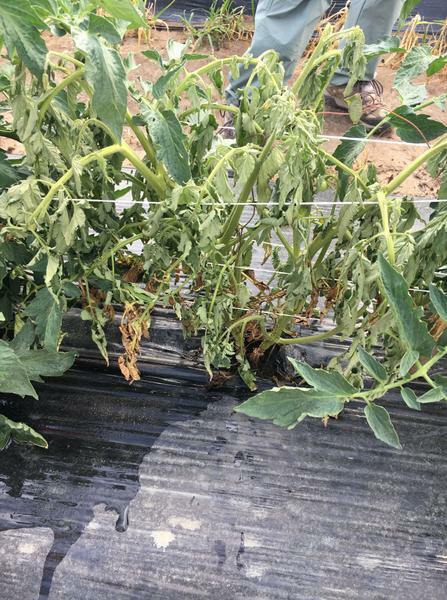 Field-grown tomato plant affected by southern blight. Photo courtesy of A. Strayer-Scherer.